I love something artsy or sometimes.. something magical at the same time. Cause I think it's wonderful and I'm easily attracted to something different. And I try to connect it with music, just thinking about it and every momen in our life have a different soundtrack, just like a movies. I watched too many movies,made a lot of fantasy, oh my bad. I very easily amazed simply because my favorite music suddenly became a movie soundtrack, it feels like, wow it's my favorite song. then I guessed the end of the movie and turns outs its a plot twist, whoa what an amazing movie, it looks like our life, we never know anything. And because I really love something artsy or whatetever it is, I always make a plan for my photoshoot outfit, I always think about the details, and yes I'm always thinking about the location for take a photos too, because I love outdoor photos and the lighting is very great and natural. Obviously with the help of the photographer, and so grateful I have a great bf who always helped me, he is my personal photograper, the one and only, I think. Since it's October, which American Horror Story season five has just begun( I love Lady gaga and her acting so bad, and if you caught it, its feels like The Shining at the first scene, and the rug too~) so many people show off their halloween costume with trippy make up that always make me amazed. so let's say this is my black-ish outfit for halloween, black lipstick, off shoulder black dress--that I got from Stylemoi, and statement necklace. I'm so happy when I received my package from Happiness boutique . 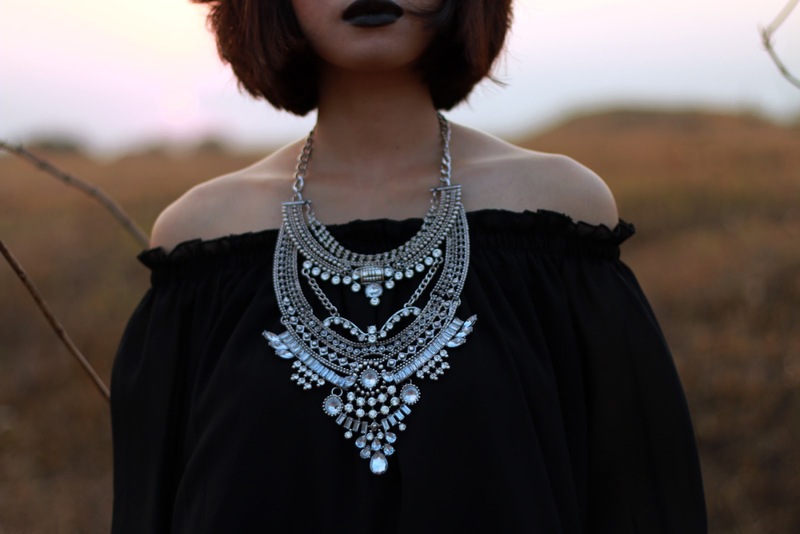 I always wanted a necklace like this, instantly gives you a boho vibes and edgy at the same time. Simply check all the various types of statement necklace here and spread happiness around the world! Amazing hat! I'm impressed by your style and this look! This is such a beautiful outfit. I absolutely love that hat. It is the perfect finishing touch! This is such a beautiful outfit. I can see you wearing that in a mysterious movie or a cartoon. Lovely look. love love love this outfit! that necklace is killer! Incredible outfit. Your face and everything about this photoshoot is amazing! I've got the exact same necklace and styled it with an off the shoulder top, too! i've been obsessing over the new season of AHS, too; Lady Gaga is a surprisingly adequate actress. I'm not too big on the plot for now, but I'm in love with Ryan Murphy's visuals! Have a lovely week, Rin! Perfect! Love the bohemian feel of the outfit and your nose ring. These are beautiful photos, love the necklace! you are perfection, girl!! makeup, hair, outfit, everything! Oh so edgy I love the look:). Happy new week:). This look is amazing! love your dress so much! accessories are perfect and boots are lovely! kisses! Absolut in Love with your look!!!! Here you can select used car from many car models, version, brands, and best range, features that customers can choose best as personal need from anywhere or anyplace.